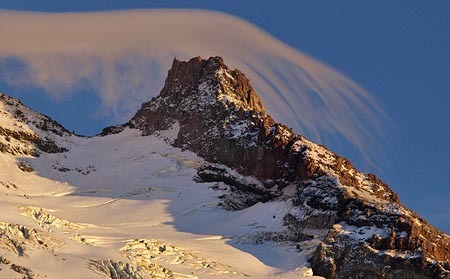 Visitors to Timberline Lodge cannot help but notice the huge monolith on the southwestern shoulder of Mount Hood parting the Reid and Zigzag glaciers. This 9,543 foot spire is Illumination Rock, and a signature feature on the mountain. What few visitors know is that the rock gained its name in the early days of mountaineering on Mount Hood, when a series of expeditions were made to illuminate the mountain so that it might be seen from Portland. Several of the early lighting schemes focused on the steep saddle above Illumination Rock, though other spots were attempted over the years, including the crater and even the summit of the mountain. In modern times, such a scheme would involve riding a snow-cat loaded with fireworks from Timberline Lodge to the edge of the Zigzag Glacier, then using skis or sleds to reach Illumination Rock. But in the late 1800s, this effort was much more daunting. The trip began with a day-long wagon (or horseback) ride from Portland to Government Camp on the old Barlow Road. From there, the expeditions spent the next two days hauling their explosives up the 6,000 feet and six miles to Illumination Rock – there was no convenient road to timberline, and no lodge there, yet. Some of the expeditions used horses to pull heavy sleds, while others relied on human power to carry the fireworks to the top of the mountain. In the 1800s, the Zigzag Glacier also presented a more dangerous barrier than exists in modern times. The glacier was much larger, and the illumination teams were very much in danger of falling into crevasses. The early adventurers also lacked communication that we take for granted today. A modern illumination effort would almost surely rely on cell phones for coordination and safety, while the early efforts relied on pre-arranged times to communicate with signal flares and mirrors. 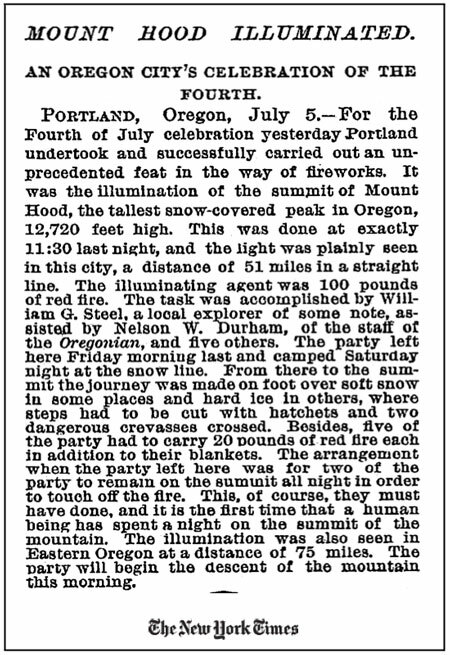 The first recorded illumination occurred in 1870, when Perry Vickers climbed to the summit and set off several magnesium flares to celebrate July 4. The displays were seen from below on the mountain, but not from Portland. Vickers campaigned for a larger display with potential financial backers in Portland, and staged a second display of flares in 1873. 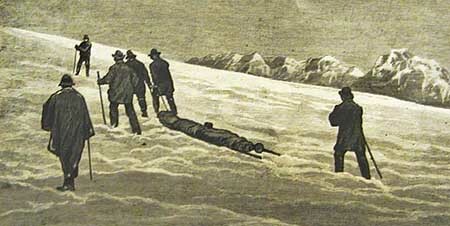 Attempts by other groups in 1877 failed due to the extreme conditions on top of the mountain. So far, no display had been seen from Portland. 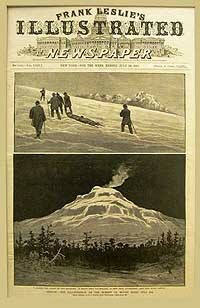 On July 1, 1887, a blue ribbon expedition departed for Mount Hood with 100 lbs of flammable “red fire” powder and a plan to illuminate the mountain on the evening of July 4. 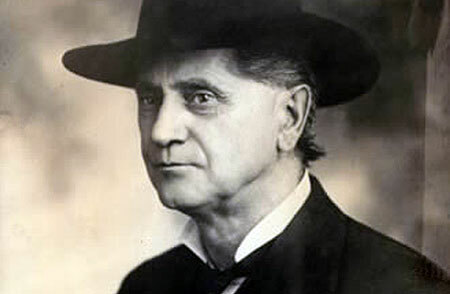 The expedition was led by William Gladstone Steel, the legendary “Father of Crater Lake National Park” and irrepressible force of nature in his time. Steel’s group reached Government Camp on July 2, and established a base camp high on the mountain the next day, after a difficult and sometimes harrowing trip up the mountain. The weather was bitterly cold on July 4 when the party made the final ascent to Illumination Rock, crossing the treacherous Zigzag Glacier. Steel and Dr. J.M. Keene set up a high camp near the rock, where the illumination would occur. The rest of the party descended back to the base camp below timberline to watch and wait for dark to fall, and the scheduled lighting of the mountain. Steel and Keene finally lit the red fire powder at 11:30 PM, and the display on the mountain was easily seen from Portland, Salem and many other communities around the mountain. The adventure for Steel and Keene did not end there, however. Upon their nighttime descent from the rock to the base camp, the pair slipped partway into a crevasse while crossing the Zigzag Glacier. After this narrow miss, they became disoriented, and missed the base camp by a mile, spending most of the night in an improvised camp below timberline before the searchers from the rest of the expedition found them. 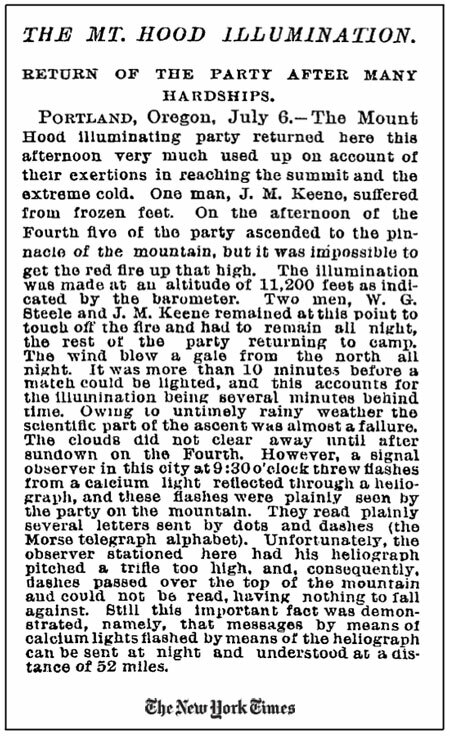 The story of the first successful lighting of Mount Hood on July 4, 1887 was a local sensation, and was recounted in newspapers around the country (see New York Times accounts, above and below). 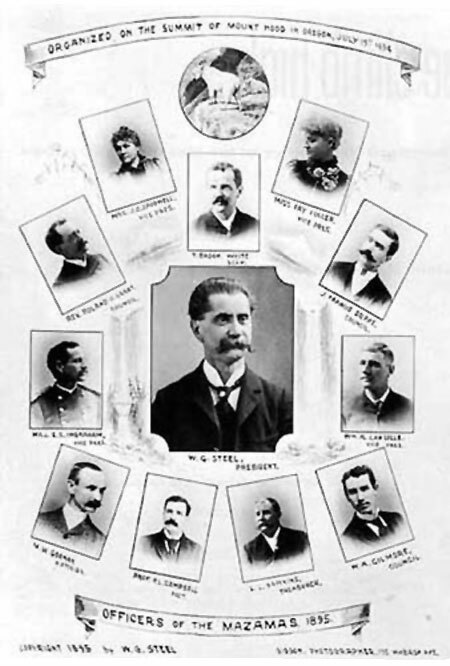 The success of the 1887 effort led to a repeat climb in 1888, also led by Will Steel, and several subsequent efforts over the years that followed. The last formal illumination effort came in 1969, celebrating the 75th anniversary of the founding of the Mazamas. Compared to the earliest attempts, this lighting extravaganza was modern in every way, but the William Gladstone Steel connection persisted: Steel was a founder and elected the first president of the Mazamas when the club formed on the summit of Mount Hood in 1894. The 1969 expedition carried boxes of flares, mortars and rockets to the 9,000 foot level of the mountain in a snow-cat, then teams of Mazamas went to work carrying the fireworks to designated spots around the crater and along the summit ridge. Dozens of rockets and hundreds of flares were positioned for the display. On the evening of July 19, interviews with climb leaders were broadcast live on a Portland radio station. Later, Governor Tom McCall dedicated the lighting ceremony by telephone, paying tribute to the fact that, on that day, the Apollo 11 astronauts had just landed on the moon, which shone full on Mount Hood that night. The Mazama lighting was the most spectacular in the history of the illumination efforts, lasting nearly ninety minutes, and lighting the mountain for miles in all directions. Consistent with the modern times and their stewardship mission, the Mazamas volunteers spent the next day carefully retrieving mortars and spent flares from the slopes of Mount Hood, removing all traces of the lighting from the mountain. Given the expanded wilderness protections that now encompass much of the mountain, it is unlikely that we will ever see another illumination of Mount Hood. Instead, we are left with news accounts, sketches and photographs of a bygone era — though Mount Hood may someday emerge from dormancy, and provide some lighting of her own! According to Oregon Geographic Names, it was the first successful illumination of the mountain in 1887 that gave Illumination Rock its name, though many illumination efforts took place near the rock over the years. For his part, William Gladstone Steel was honored by the naming of Steel Cliff, the wall of rock that frames the east side of the crater, and that was lit up by many of the illumination displays. Steel is also honored for his relentless 17-year effort to create a national park at Crater Lake by the naming of Steel Bay, along the north shore of the lake. With these names on our modern-day maps, we are forever reminded of the unique spirit and imagination of the early mountain explorers.